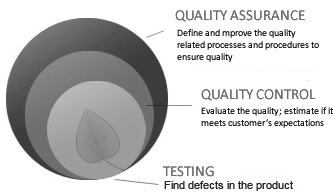 Software testing and quality control are essential subsets of software quality assurance. This diagram illustrates the relationships between these distinct, but interrelated levels. Support Gurukul provides comprehensive execution at every level, ensuring true Quality Assurance. Integrating a solid quality assurance methodology into the larger process of software development is the best practice in every situation. Support Gurukul never begins a project of any type without including quality assurance. Our application development experience proved that QA increases software quality and lowers TCO, whether for custom business solutions, software products or services such as software-as-a-service (SaaS) systems, or for an outsourced portion of a larger development effort. Custom Business Solutions benefit from mitigation of risks related to misunderstanding or miscommunication of business requirements, possible system failures, and others. Software Products and Services have a high degree of vulnerability to software flaws or deficiencies, because a company’s future sales and ongoing revenues are directly dependent on the reliability of the product or service offered. Whether you’re a startup business, an enterprise, or a product development group, quality assurance is essential to your long-term success. Software Development Companies and Systems Integrators can rely on Support Gurukul to incorporate solid QA principles into every project outsourced or assigned to us. We ensure that the modules we develop work flawlessly and satisfy every functional, technical, and architectural requirement.